Keeping your lawn in shape requires maintenance that must be performed on a regular basis. The most common tasks include: mowing, regular fertilization, aeration / thatch control and weed control. The most labor intensive aspect of a maintaining a lawn is mowing. Besides mowing on a timely basis, perhaps the most critical part of mowing is maintaining a sharp blade, and not removing any more than 1/3 of the grass blade during any one mowing. 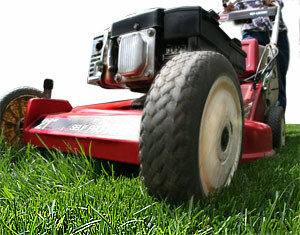 Lawn specialists at one time recommend cutting the grass shorter than normal the first time in the spring. This low cutting was believed to allow the sun to reach into the crowns and stimulate new growth for an early green up. We now know that this early scalping does more harm than good. In fact, scalping at any time during the year can cause severe damage. Measuring mowing height: mower decks generally have a range of 5/8" — 3-1/2". To check height, place the mower on a hard surface and measure the distance between the blade and the hard surface with a tape measure. CAUTION: I can't imagine someone actually not doing this, but make sure the mower is turned off before doing anything underneath the mower. Fertilizer, whether chemical or organic, provides the basic building block for a healthy lawn. The bare minimum number of applications is 2 with fall being the most important time to fertilize. Professional lawn care companies will often apply fertilizer to a lawn 4-5-6 times during the growing season. Why do this if 2 are all that you really need? The answer is that professionals turfgrass managers don't just apply the same fertilizer with each application. Professional lawn fertilizers are specially formulated for the different times of the year. Some fertilizer applications are blended for root development, other times they are formulated for developing a healthy leaf and other times it's just a maintenance fertilizer combined with special weed controls. In most urban soils, aeration is a good annual maintenance task to keep your soil in good condition. The removal of small cores of soil and depositing them on the surface helps reduce thatch buildup. The cores contain thousands of microbes that will eat away at the thatch layer, keeping it under control. Aeration combined with a topdressing really goes a long way to reducing soil compaction. Compacted soils result from too much water or too much traffic over specific area. The process of aerating also encourages new root growth in the plant. For cool season grasses, fall is the ideal time for aerating the lawn, and for most warm season grasses, spring is a good time as long as these grass-types are actively growing. Weeds are a fact of life and even in the healthiest lawn, a weed is likely to show up. While not a reason to panic, an over-abundance of weeds use up the limited resources in the soil, making it harder for the grass plant to find what it needs. Maintaining good weed control as an ongoing program means that your soil will be supplying nutrients only to the lawn as well as keeping the lawn the nice even base that emphasizes the ornamental trees, shrubs and flowers that highlight the landscape. Basic lawn and landscape maintenance is easily manageable for most homeowners either by doing part or all of the tasks by themselves, or having someone else do it for them. Ignoring basic maintenance tasks only results in an deterioration of the lawn and landscape in both appearance and health.